We are excited to announce that our ‘Wave Two’ Tournament Results module is now live! Our Tournament Results module will automatically load past tournaments results (from September 1, 2016) from the tours and events above as well as future tournament results. 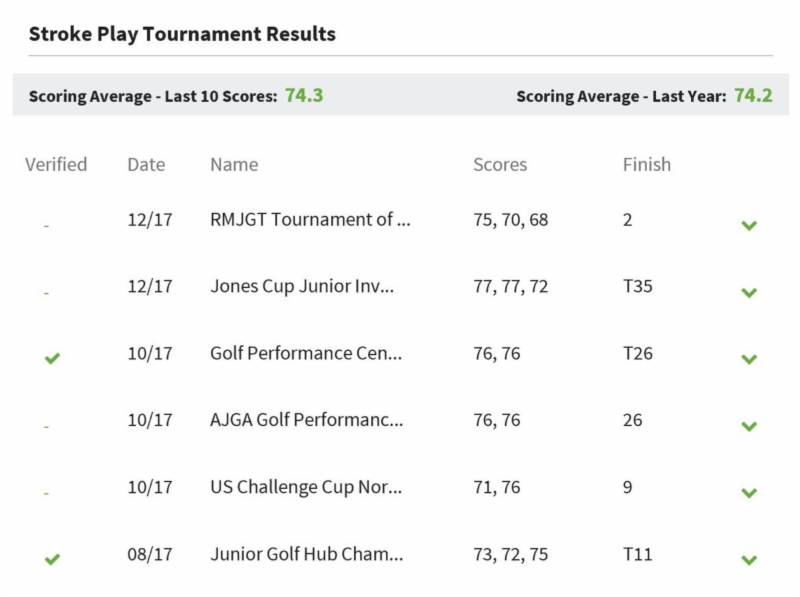 It is now easier than ever to build a great junior golf resume on Junior Golf Hub! Sign-up is FREE and your scores from big tours will be automatically added to your Hub Profile. If you are new to The Hub and would like to participate in the Tournament Results initiative, sign-up for free and make sure to fill out the Tournament Results fields during the sign-up process. When you first log into The Hub we will automatically load results to your Hub Profile. Easy! Please note that if this information is not updated, we will not be able to automatically load tournament results against your Profile. It’s important! Please note that if you do not remove the appropriate duplicates, two results will appear for the same tournament, altering your scoring average. So this is an important step! Please call or e-mail us with any questions. We’d love to discuss this new initiative with you! Email tournaments@juniorgolfhub.com or call 888-209-7410 with any questions.